and then again at the wedding reception. frugal delight that money can’t buy. I hope that they will pull those out and read them on every anniversary. is to create their first Family Album for them. groom growing up. Then follow with a few pages of their courtship. everyone should share this precious moment with you. for the bride and groom on their wedding day. (This is for the extremely organized friend…see what I’d do below). ivory linen tablecloth with silver, gold or a matching thread. Some really nice ideas, jen!! These are wonderful ideas! Thanks for sharing them!! Those are great ideas! I wish I'd thought to set aside the vows we said when we got married. My husband and I created our own unique vows…which were on a friend's computer…and I don't have a copy! Those really are priceless traditions. I also really like the wishes for the happy couple. Receiving advice from others at the start of a new marriage would have been a great way to start a union. Sweet & wonderful ideas!! Blessings! 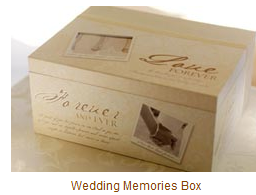 Wev'e done the love box for years, such a wonderful gift to the bride & groom. We also have some one stand at the church entry snapping photos of guests…we attach the photos to a card and list the name and relationship to the couple. Its a wonderful way for the new spouse to learn the new extended family & friends. Where were you last year when I got married? Great Ideas! All of these traditions are really beautiful! On our wedding my husband and I packed up a time capsule of love notes and items from our wedding. We got married in 2000, so there were lots of them around. We will be opening it on our 10th anniversary this next year. We did something like this at our wedding. And we had the caterer pack the notes with our anniversary tier. We didn't see any of them until our first anniversary and it was so fun to read people's memories of our wedding day while we ate our cake! Those are great ideas! We did something similar to one at my friends wedding last month. We'd made paper flowers for the tables and we used pieces of the same papers for people to write wishes on and then place in an apothacary jar. Now she has a beautiful jar filled with papers from her wedding and love from her family and friends. When my grandmother got married in 1932, she started a small black notebook on her honeymoon. In it she recorded where they went on their trip, the towns they passed through, where they stayed and ate, how much things cost, etc. When I got married in 1983, she gave me that book just before the wedding and told me to write down things about our honeymoon and then pass it on to my daughters some day to do the same. Last weekend, my oldest son got married. So I purchase a small black leather journal from Target, decoraged it up with ribbons that matched the wedding colors, made my daughter-in-law a card which explained the tradition. Hopefully she will be writing in it on her honeymoon trip and then pass it on to their children someday. I love traditions like this!